The Lotus Elise is a great little sports car and has been on my bucket list for some time, but I’ve never imagined being able to afford one. It turns all I need to wait for is one with a slight scratch and crack in a bumper, like this 2006 Elise for sale on eBay with a salvage title. The car is listed at $24,000 on eBay, which is a lot cheaper than most of the other Elises floating around for sale. Why is it so cheap? Well, if you look closely at images of the front of the car, you’ll notice some of that beautiful bronze paintwork is missing. That scratch is also a very small crack, which would be a relatively easy fix on most other cars. But the 2006 Lotus Elise isn’t just any other car. It’s special. It’s so special that most of the front bodywork is one big fiberglass clamshell, which costs so much to replace that even a little crack is enough for the insurance company to total the entire car, at least according to the seller, via Road & Track. That means that this Elise for sale has a rebuilt savage title, but that doesn’t mean it isn’t worth your love. It just means it’s almost unfairly cheapened, which is good if you’re buying but bad if you’re selling. 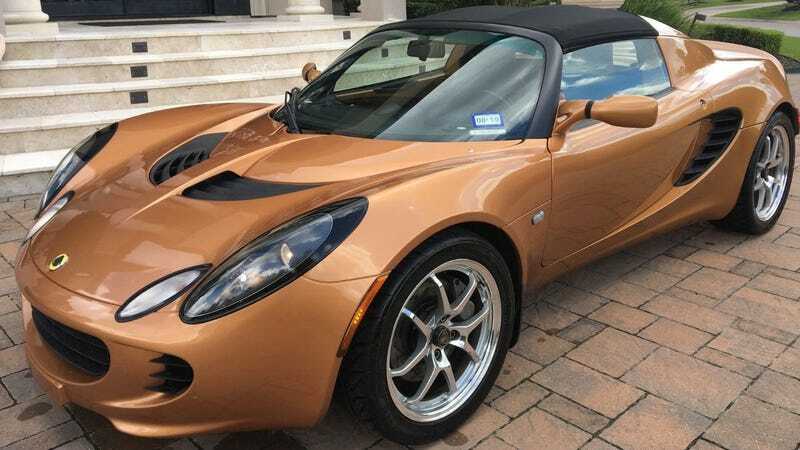 Beyond the slight body damage and excellent bronze color, this Elise has 68,406 miles on the clock, and you’ve got until Tuesday to make an offer or buy it at $24,000. The good news is the blemish is on the passenger side, so if you park just right, you’ll probably never have to face it. I don’t care that this bad boy is totaled. I’m happy to give it lots of love anyway.